Further development steadily remains clear and certain for Central Luzon as key economic indicators point to even brighter prospects for the region to enjoy. With the Peso purchasing power almost unchanged from the fourth quarter of 2012 to the first quarter of 2013, coupled with the general improvement in the peace and order situation and the effect of major projects implemented in the region, the people of Central Luzon can expect more positive things to come. In its economic situation report, the National Economic and Development Authority (NEDA) forecasted that the region’s agricultural output, particularly palay and corn production, for the first semester of the year, is expected to be higher compared to the same period last year, with increased area planted, sufficient irrigation and the implementation of quick turn around and rice rationing technologies in Nueva Ecija and Pampanga, two of the major rice production provinces in the region. Economic zones and Freeport zones in Clark, Subic and Bataan, the report said, are seen to bring the much needed jobs for the population as economic activities in these investment areas remain upbeat, with investors, local and foreign alike, pouring in high-value investments. Currently, Clark Freeport has 682 locators, Subic Freeport is host to 1,349 registered locators, and Freeport Area of Bataan has more than 70 locators. Severino Santos, regional director of NEDA, said major infrastructure projects completed, ongoing and soon to start, will have direct impact to the regional economy due to their use. The full operation of the coal-fired GN power plant in Mariveles, Bataan will help solve power woes not only in Bataan but also in other areas of Central Luzon. The Tarlac-Pangasinan-La Union Expressway (TPLEx) which connects Central and Northern Luzon, is set to start operations by the end of this year, and is expected to provide better accessibility and boost trade and tourism. The implementation of the Plaridel By-pass Phase II also promises greater benefit in terms of easing traffic congestion at urban areas in Maharlika Highway leading to Cagayan Valley region. The regional economy performed positively during the first quarter of 2013, with agriculture, investments, tourism and air transport behaving progressively as solid drivers of growth. Comparative data gathered from the National Economic and Development Authority (NEDA) showed increase in palay and corn production by 6.44 percent and 25.34 percent respectively, during the first quarter of 2013 compared to the same period last year. In the same comparative period, swine population also increased by 15.62 percent. Tourist arrivals were higher by 5.7 percent in the first three months of this year over that of 2012. Clark International Airport Corporation (CIAC) had more flights and passenger traffic in the Clark International Airport (CIA) with the addition of international flights offered by budget airlines. Investments totaled more than P17 billion, a major contributing factor to the 80,000 new jobs created, thus, improving the employment situation in the region. Inflationary pressures pulled up prices of goods and services in the region but inflation remained low at 3.5 percent. The results of the January 2013 Labor Force Survey (LFS) revealed an improvement in the region’s employment situation. National Statistics Office (NSO) counted 3.932 million employed persons in January, representing a net job creation of 80,000 compared to the fourth quarter (October) of 2012. Employment rate during the period was 90.9 percent, an improvement against the 90.7 percent registered in October and 90.3 percent in January of 2012. Better employment prospects resulted from the continuing efforts of the Department of Labor and Employment (DOLE) to work closely with local government units, other government agencies such as the Department of Trade and Industry (DTI) and Technical Education and Skills Development Authority (TESDA) which assisted job seekers through the conduct of job fairs, provision of livelihood assistance, and skills training and enhancement. Data from the Bureau of Agricultural Statistics showed an increase of 40,497 metric tons in palay production during the first quarter of the year, representing 6.44 percent increase from last year’s same period performance, where the region posted 628,879 metric tons of palay produce. More than one-half (51.25%) of the increase in production was attributed to the 7,465 hectares of additional irrigated area in Tarlac which benefited from the Rehabilitation of the Tarlac River Diversion Weir project. Swine population increased by 15.62 percent from 1.64 million heads in the first quarter of 2012 to 1.89 million heads in 2013. All provinces in the region had increase in swine population except for Aurora and Zambales. Bulacan accounted for more than one-half of the swine population. Santos bared that investments remained upbeat in the region as different government agencies and investment areas (ecozones and freeports) maintained the more than P 17-billion investments generated in the region for the first quarter of 2012 and 2013. Investments amounting to P 4.85 million under the business name registration of the Department of Trade and Industry generated 33,720 jobs in the first quarter of 2013, higher than the 28,916 jobs created for an investment of P 2.89 million in same quarter in 2012. Bataan, Pampanga and Zambales benefit from higher investment and more jobs as hosts to economic zones in the region. 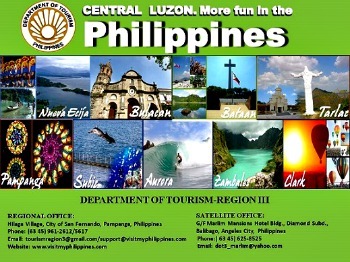 With the intensified campaign of the Department of Tourism, Central Luzon welcomed 493,862 visitor arrivals from January to March this year, registering a growth of 5.7 percent compared to the same period last year. Domestic tourists, according to Director Ronaldo Tiotuico of the DOT, remained the largest group of visitors although data showed their number decreased from 401,936 to 347,985. Foreign visitors increased its share from 61,765 in the first quarter of 2012 to 137,204 this year. Foreign visitors included Koreans, which comprised the biggest bulk of foreign arrivals, and other nationalities like Singaporeans, Americans, Hong Kongers and Japanese. Subic and Clark were noted as the preferred destinations of foreign tourists. Moreover, data from the Clark International Airport Corporation revealed that the number of flights at the Clark International Airport surged by 67.2 percent in the first quarter of 2013 compared to the corresponding period in 2012. Passenger traffic likewise jumped 63.6 percent during the quarter, from 252,163 to 412,417 in the first quarter of 2012, as a result of new international flights offered by budget airlines. Jim Jimenez, president of the Pampanga Chamber of Commerce and Industry, Inc. (PamCham) said the business sector in Pampanga is happy and optimistic about the tourist influx in the region, specifically that it boosts the business sector, citing the huge daily average spending of tourists, especially foreign ones, which provide businesses some leverage. Jimenez, meanwhile, encouraged the government to boost spending in infrastructure to further accelerate development. Residents of Central Luzon enjoyed a relatively peaceful environment, according to Philippine National Police Regional Director PCSupt. Edgardo T. Ladao. Crime incidence decreased in the first quarter by 40.84 percent, from 999 index crimes to 591. Crime solution efficiency also improved for both index and non-index crimes. While travelers to Bataan and Zambales passing through the Gapan-San Fernando-Olongapo (GSO) Road may have experienced momentary heavy traffic caused by the ongoing road and bridge widening projects in Guagua and Lubao in Pampanga, the nearing completion of these road improvement projects will greatly ease traffic along the GSO Road and significantly lessen travel time, the NEDA report cited. Amanda Battad, the newly-elected president of the Bataan Chamber of Commerce and Industry, lauded the government for the widening and rehabilitation of the GSO Road, saying the project will result in long-term benefits, not just for commuters, but also for the business sector. “We just have to bear with the momentary inconvenience the traffic build up in some portions of the road may cause, because, in the end, it is us who will fully benefit, long term,” Battad said. Battad, who is the proprietor of the Amanda’s Marine Products which supplies processed fish products in big food chains and supermarkets, said that the nearing completion of the road project will not only ease traffic, but will also surely provide businessmen like her increase in revenue as they will save on time and gasoline consumption. Battad transports products to Manila almost daily, plying the GSO Road. Meanwhile, those travelling along the Plaridel and Bustos portions of the Cagayan Valley road found relief with the opening of the 14.65 kilometer Arterial Road Bypass Project Phase 1 with a 2.4 km access to Plaridel in Bulacan in November last year. The road project reduced travel time for vehicles passing through this portion of the Cagayan Valley road by 23 minutes.